NWT Speed Skating’s Wren Acorn finished 22nd overall, in a field of 32, on her debut at Canadian Junior Championship level. Wren is in the first of five years of eligibility for Canadian Juniors, in which the country’s top skaters aged 14 to 18 race for places in the Canadian team for the World Junior Championships. She was the best-performing of four 14-year-olds taking part. “I’m overjoyed with how it went, honestly,” said. “It was a really, really good competition. Wren finished 18th in a 32-strong field in the 1,000m distance, 25th over 1,500m, and 22nd in the 500m sprints. 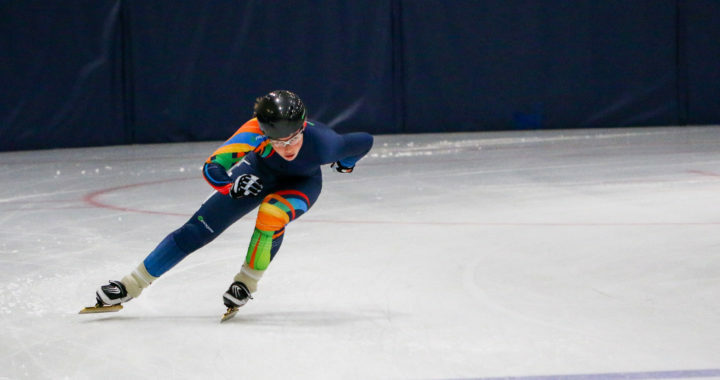 “She worked her race plans to perfection,” said NWT Speed Skating coach Shane Clark. “It was great to be able to go to this one and not have it be a tremendous deal for now,” added Wren, “when there’s not a lot of pressure. It was exciting watching older skaters.